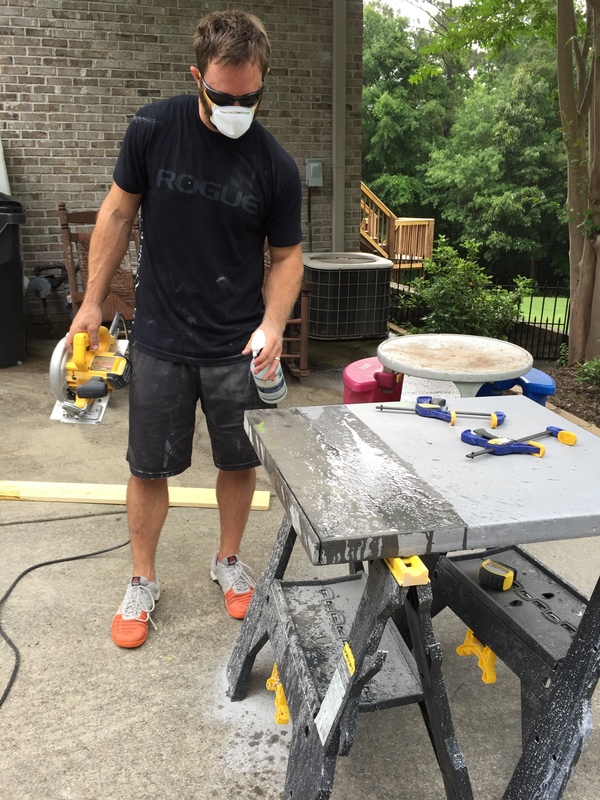 With our concrete countertops came a lot of different questions and I am here today to answer them as best as I can! If you need a reminder – we are working on the basement kitchen chronicles. We started this room a little over a year ago so anyone staying in our basement could have their own kitchen space. Here are some back posts about the room, the cabinets and about the countertops…. These photos were taken almost a year ago so that’s why the grass is green, the belly is big and why the boys are so little 🙂 Dang they grow fast! Okay so let’s get to it…. 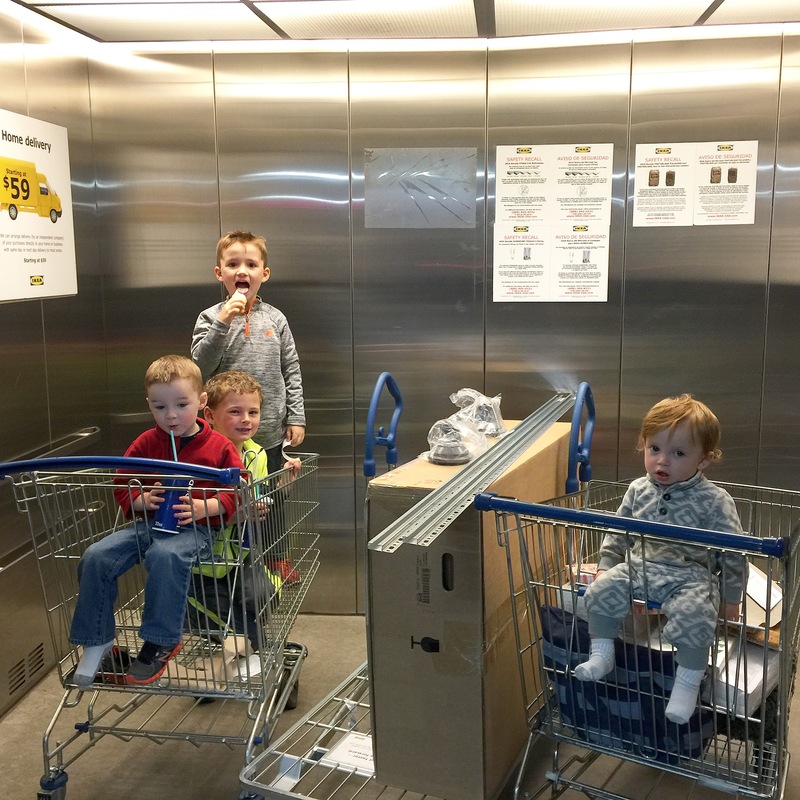 QUESTION #1 – What would you do if the countertop didn’t fit? Well – excellent question and we actually did have that occur with one piece. The wall is a little warped and even though the 3/4″ melamine fit, a 2″ countertop didn’t sit as flush. I, of course, freaked out and threw my hands up in the air and decided we should just scrap the entire piece and start over. Jeremy, of course, freaked out and threw his hands up in the air and we both sat and cried. And then we figured….why not try to cut it?! I mean – we cut our cement blocks for our fire pit….why not cut this concrete too? It was gross and dirty work but really we just needed a little sliver off of one corner so that we could slide the stove in properly. He sprayed it down with loads of water and used a circular saw to wet-cut it. The blade he used is intended for masonry so it worked perfectly! We tested it in the spot and voila! Disaster averted. 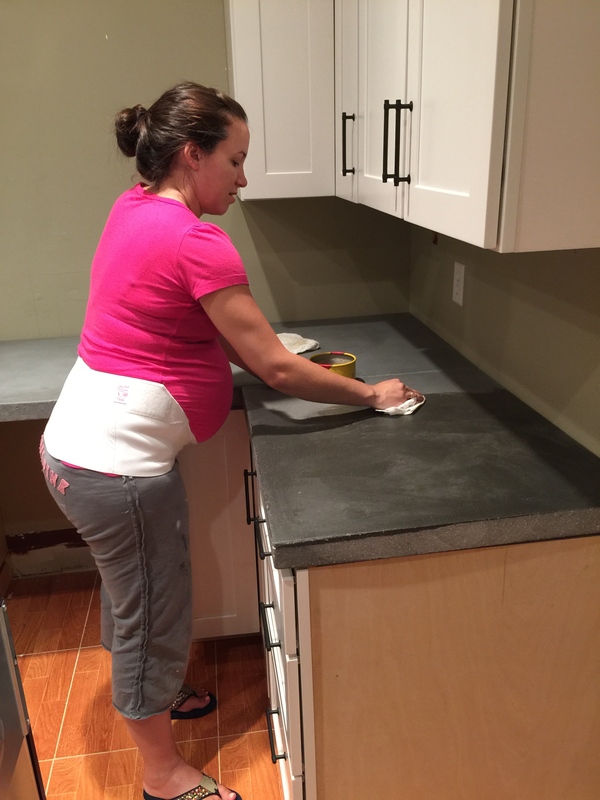 QUESTION #2 – How did you finish the countertop? 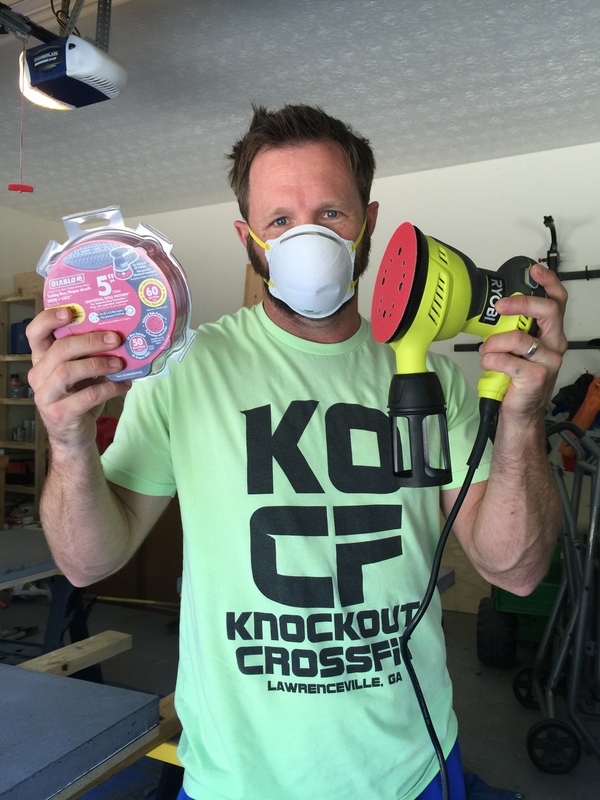 Jeremy is posing with the sander and sandpaper but let me assure you – he quickly realized that he did not want to do this job. So I hopped on sanding duty while he watched the kiddos attempt to kill each other 🙂 KIDDING. They are precious angels that never do anything crazy. 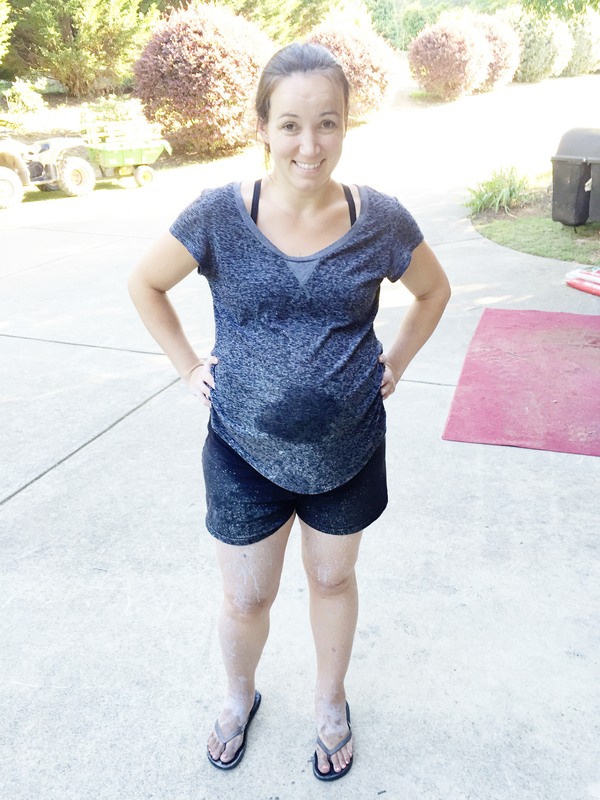 Basically you just take a sander and a spray bottle of water and constantly wet sand the entire surface. It is crazy messy and will ruin your pedicure but it is amazing how smooth the countertop gets. 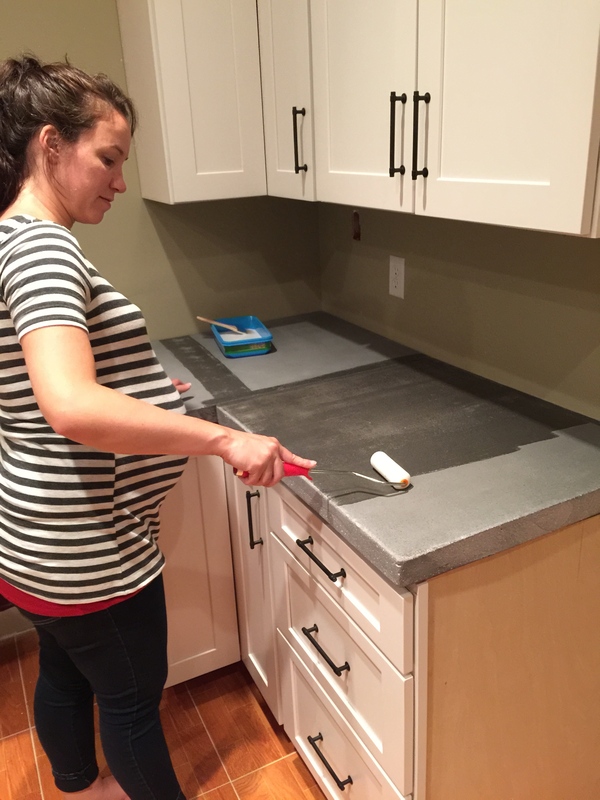 QUESTION #3 – How do you seal the countertops? Ahh….our biggest mistake yet! We did install them and thought we had a good understanding of the sealing process…but we actually handed over the keys to the castle a little too early….figuratively speaking. We actually bought a water sealer…..which is what you see me doing there above…but in actuality, we should have bought a penetrating sealer. We did three coats of the waterproofing sealer and then let that dry. It does darken the concrete a little – which we fully expected. Then we used a furniture wax to fill in the holes. Another mistake on our part. 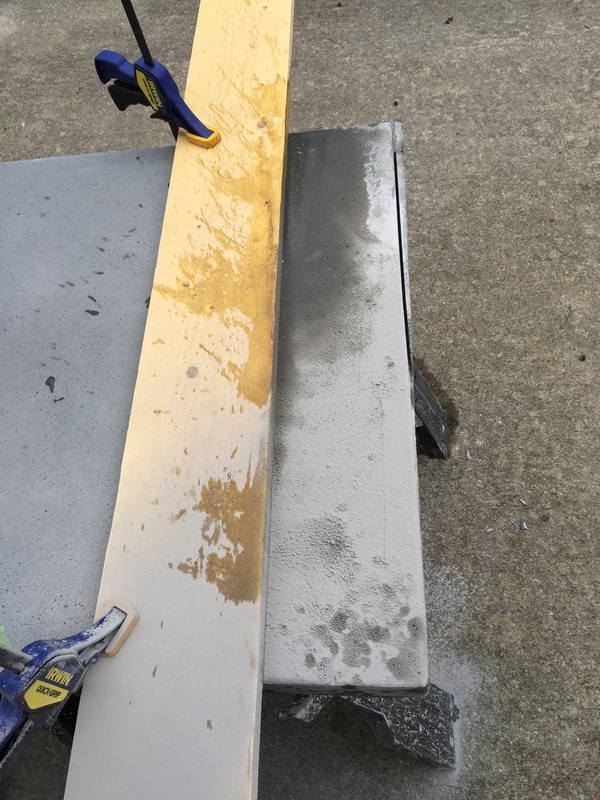 In hind sight, we should have done a slurry before installation and then sanded it all down and then used a penetrating sealer like this one and then finished with a concrete countertop wax. Now we do have some olive oil marks from a drippy bottle but I am confident we can fix our mistakes! QUESTION #4 – Is that an apron front sink I see? Yes! We scored the double basin, apron front sink from Ikea and we absolutely love it! The sink was necessary to have before building the forms and pouring the concrete so we were happy when everything fit together like a puzzle! 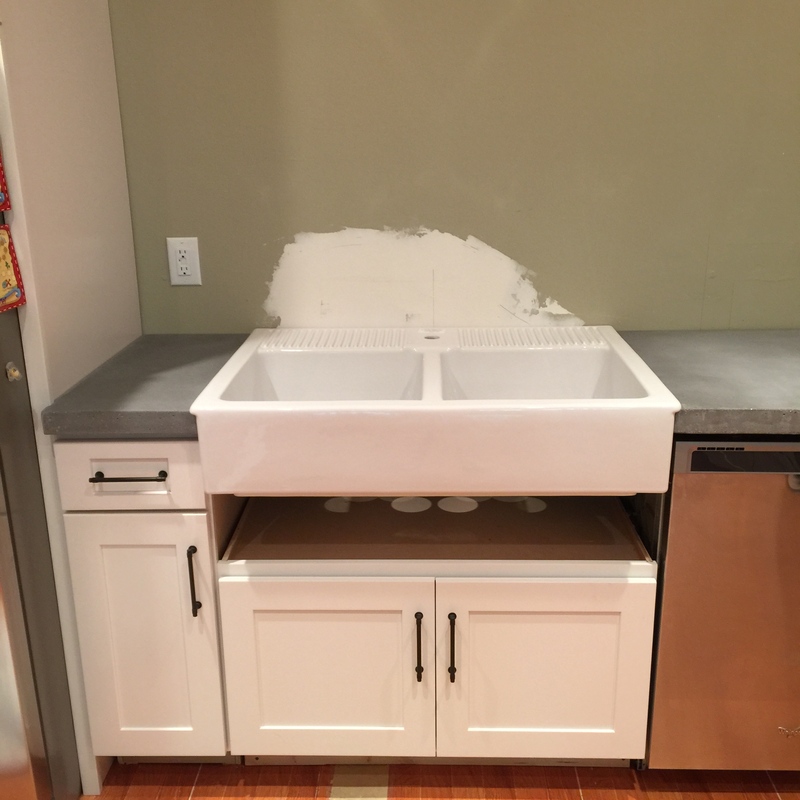 We definitely have more to share as this was a BEAST to install and also how we retrofitted that above-the-fridge cabinet into a base cabinet for this sink! QUESTION #5 – How much did the countertops cost? Can you do a budget breakdown? TOTAL : $279.72 ALL IN for counters finished. Any other questions – just put it right there in the comments! p.p.s. Another frequent question was why we didn’t do it like Jenny at Little Green Notebook who used Ardex on plywood. Ardex is a concrete mix that you trowel on instead of pour and we personally didn’t like the finish as much. Plus – you have to create the countertops in place (like Chris & Julia) and we didn’t feel like it was fool proof enough for us. If we screwed up (which we obviously did! ), then we wanted to be able to scrap the section and start over! In the end, there are numerous ways to skin this concrete cat and I do love that all these DIYers did it differently! It just proves that there is no wrong way! The sink really does look awesome – and given a choice (for around the same cost) of concrete counter-tops vs. cheaper laminate I would ALWAYS choose concrete. I, a lso, would be nervous to pour them in place – it’s cool to see everyone’s different methods, though! I love that you give a nod to the other big DIYers out there and made a good statement that there is more than one way to do something, and it is all about your confidence and skill level. Love your method because I, too, would want to be able make oopses with forgiveness. Ha! I was going to ask the CLJ question myself, but figured you covered it with them. I’ve actually never seen concrete counters done the way you and Jeremy did, so it’s been interesting to see this process. How much countertop did each bag of concrete make? Trying to figure out how many I would need. Thanks! The bag should tell you how much it will make! We also have laminate counters ~ lots! ~ and I think using Ardex may be our best bet … definitely the most economical. But not having seen the LGNB blog which is referreed to, I’m assuming the Ardex was applied directly on the laminate? Or must we first install plywood, etc., then apply the Ardex? Our counters turn, w/the laminate seamed at two angles rather than one right turn, so “covering w/wood” will be tough (for us!). I’d like horizontal wood planks on our backsplash, but need to find some way to apply those, because our entire backsplash wall is also laminate. What about Ardex for it, too ~ or is that too much concrete … and crazy?!? Thinking further, a plaster-type finish might be *easiest* … Help!? Ideas? I think Jenny at LGN did it two different ways – once in her laundry room to laminate and once on top of regular plywood in her kitchen. I definitely think that Ardex is great for the laminate changes – check out YHL for their review on it too! They did their kitchen counters and it looked good. But to answer your question – I don’t think you need to put wood on laminate for it to work. There are tiles that look like wood if you want something like that for your backsplash vs what we did which was the laminate wood….and I don’t think a plaster would look bad either. I’ve seen some that are this textured plaster that looks amazing but I would question how easy that is to clean as a backsplash! Reading this gave me an idea of having my own concrete countertop on my dirty kitchen. Your counters turned out beautiful! Thank you for providing the budget and supply breakdown, that is really helpful! My husband and I are talking about tackling concrete counter tops and are in the process of researching all the various supplies and tools. I’m curious, in your list of supplies you mention to “use the regular” Quickrete priced at under $4. Can I ask why you would recommend that over the countertop mix that you used in your tutorial? We would obviously rather choose the cheaper option if they are interchangeable, but I’m wondering with your experience which you would recommend. After you install them on the cabinet, do you fill the seams with anything (like silicone)? I am worried about food falling in the seam where the two sections of countertops meet..
You can. 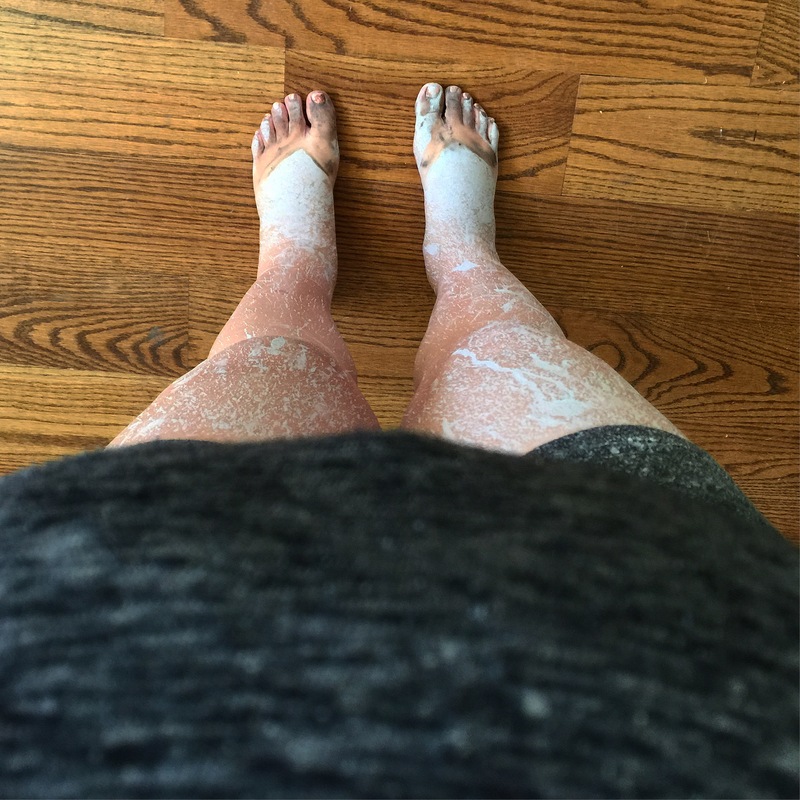 Our friend who does these for a living does a slurry and then seals them and does seams with a clear silicone but wipes away a lot of it. Hope that helps! Can you tell me how the counter tops are holding up? I really want to do this, but I keep hearing that they stain easily. Are your’s showing this? Our friends use the regular Quikrete all the time for counters and it always looks great. I would recommend it because the cost alone. If you are looking for more of a slate look, then obviously, you can use the countertop mix but that’s a personal preference thing. Good luck! 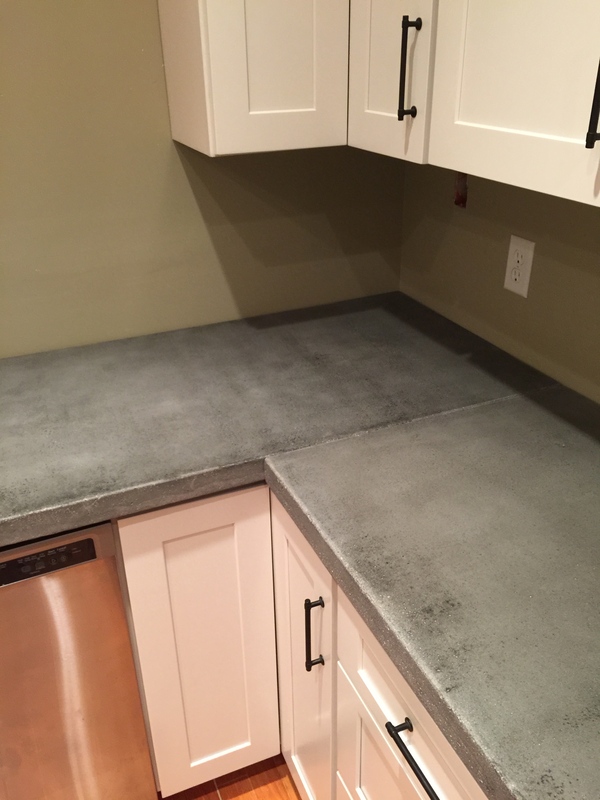 Question, my husband and I made a concrete counter for our kitchen; sealing with approximately 7 coats. We’ve noticed a few perfectly rounds spots/stains, assuming they were grease or oil stains I’ve made several attempts to remove or draw out the grease with Dawn, baking soda and vinegar. It’s been about a month and I don’t know ignore it’s me being crazy or what but I feel the spots are multiplying or darkeneing. UNTIL it dawned on us that the ninja blender suction cups line right up with the multiple spots/stains. Do you know how I could remove these spots/stains?